Last night (Monday) I had a long ride scheduled. I don’t usually have long rides scheduled on weekdays, but with a short sprint race this past weekend, and the Boston Marathon this upcoming weekend (well, Monday) it was gearing up to be two weekends without a long ride. Given the primary emphasis for this season is Rhode Island 70.3 and Ironman Canada (with Rhode Island actually being more important for a number of reasons), my coach is really trying to front-load as much of the bike build as possible to stay ahead. Which…put me out on the road for a casual 2hrs and 45 minutes of Zone 2 riding (medium intensity)…so basically three hours. Due to work messiness I wasn’t able to get on the bike until nearly 6:30PM, or about 90 minutes before it got dark. But it gave me enough time to do a quick lap of the route and ensure there wasn’t any rocks/nasty potholes, etc… Given I ride there virtually every weekend, I wasn’t too concerned. Also, one of the advantageous of riding at a place like Prince William Forest National Park at night is there is no traffic. Being a closed loop, nobody has any reason to be there unless they are camping. I had a whopping total of one car pass me during the three hours. That’s it. I had outfitted my bike the night before with a super-bright front HID light. This light easily illuminates the whole road (both lanes) for about 25-50 yards in front of me, and since it’s attached to my helmet, I can turn my head and also look into the trees (useful for illuminating other things…but more on that later). You can see the battery pack below, which is simply attached to the frame using Velcro. A small cable then runs up to my helmet. In addition, I placed a super-bright red blinky thing on the back of my bike and wore a reflective sash. So…off I go. For the most part the weather is good. Mid-50’s and overcast. On my first loop I notice numerous deer herds. Probably counted 30-40 deer in total. More than I’d prefer, but virtually all of them ran out of the way and generally stayed off to the side, so that was good. Plus, only two rocks on the road to worry about. Eventually, day gave way to darkness and into the night I slipped. It is interesting all the things that catch your eye at night on a dark road without any street lights. First, the road marker signs brightly illuminate because of my headlamp. Of course, the deer eyes reflect back at you, making it easy to pick out them from quite a ways. And lastly…the skunks are out. I ran into one Pepe Le Pew out there, but thankfully he just moseyed out of the way. He was much larger than I expected though, I thought they were kinda small. While I normally would have tried to catch a picture, I was a bit concerned he might ruin my night. So…no pic for you. Off into the night I continued though. It started raining shortly after dark, but nothing too bad – not as heavy as I thought it might get, but enough to keep you wet. I LOVE the fact that on the Garmin 705 the screen is crystal clear for night riding. It illuminates with a clean white background, and has the same level of sharpness as an iPhone. I was quite happy overall with the ride. After 2hrs and 45 minutes I ended up at 53.42 miles, not bad for a weeknight. More importantly, the whole thing was completely nonstop (never got off or stopped by bike), and all in aero. I’m really glad to be this early in the season and knocking out longer rides fully in aero without any issues. That was one of my limiters last year during some of my Half Iron races and the Ironman race. Also, for those curious why on earth I’d be using race wheels for a weeknight training ride in the dark…it’s quite simply because you have to get used to handling them in high winds otherwise race day you’ll have a fail (or will be too scared to stay aero). The one item I did note that was a bit tricky at night is judging hills and rollers in the darkness (going uphill). Given I couldn’t see the tops of them, I often mis-geared based on how far up i thought I was. Not a huge deal, but my shifting wasn’t quite as smooth as in the light based on lack of exact location on the hill. Before I head to be for the night, I would point out that I really don’t recommend going out on any old random country (or city) road and hammering away for three hours in aero. Please…please…please choose closed off roads (such as looped National Park Roads). And please please please use super-bright lights (my headlamp is not a typical $19 front bike light from Performance bike). Just don’t wanna see anyone go splat… Also, ride with a friend if on closed roads. I was out with another buddy riding, so while we weren’t paired together, given it was a loop we were always nearby. Night! « Escape from Ft. Desoto Tri Race Report…btw…1st in AG. 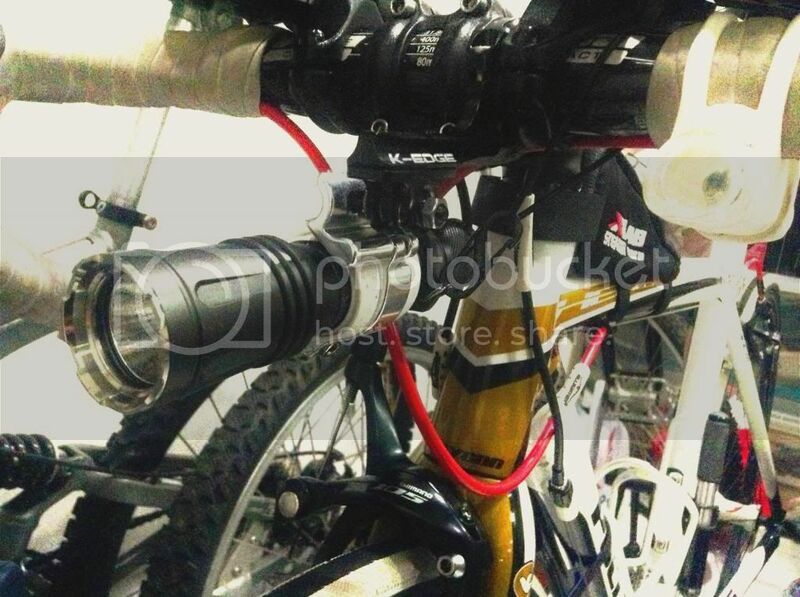 I have seen those heavy duty lights at bike stores and always wondered..what could you POSSIBLY need that for. Good work and way to stay in aero the whole time! I’m impressed you were able to hammer that out on a weeknight… I would have wimped out and jumped on the trainer. Good for you for getting out in the dark and riding! I could never do that… no matter how bright the light is! Sweeeeet light. I bet passing cars thought you were nutso. I haven’t ridden at night for about 10 years. That was when I was doing ultra-marathon bike races. Both training rides and races always involved a lot of darkness. Glad to see that the technology has progressed so well. You are devoted! I would have been on the trainer. I am a big chicken when it comes to riding/biking at night! Good call on no skunk picture! The one time I went out sans street lights and a friend I scared the crap out of myself and ended up cutting it short. The first deer would have probably caused me to turn around, haha. Good for you to get out there.. even with the late start. What a great light! I like technology. Glad you didn’t really “run into” the skunk. Boy, you are brave to bike at nite. Here in Texas, people run you off the road on purpose. Yeah, they run you off the road during the daylight hours. I would hate to see how they treat us at night here in Texas. No closed loops over 1 mile around here. I guess that means I will not be doing a night ride.